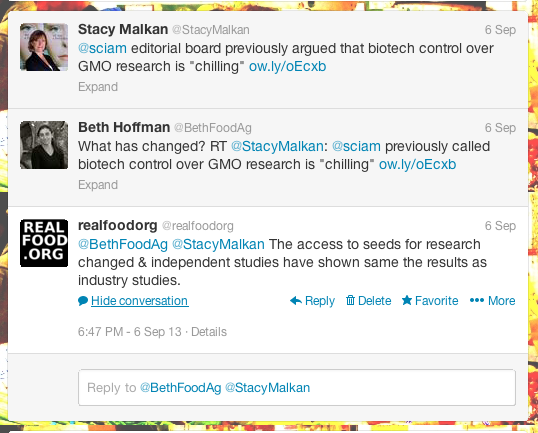 @BethFoodAg @StacyMalkan The access to seeds for research changed & independent studies have shown same the results as industry studies. This had been covered in depth just recently. Nathanael Johnson had written about the dramatic change exactly one month earlier as part of his widely followed series in Grist unpacking the issues surrounding GMO crops and foods. Responding to complaints by a group of 24 corn insect scientists led by Elson Shields in 2009 a conference had been convened between researchers and the industry at Iowa State University. Over the next six months a set of principles [pdf] was hammered out. Following that, formal legal agreements between biotech seed companies and the major public research institutions were reached. There are minor issues around the edges, but the problems raised by Shields and his colleagues detailed in Scientific American’s 2009 editorial had been squarely addressed. But the more I thought about what had changed, I found myself thinking about how the landscape has changed since 2009. Of course it’s possible to hold that nothing has changed and that the two positions aren’t mutually exclusive or even necessarily inconsistent. It’s fairly easy to imagine that someone without an ideological dog in the fight could be in favor of open access to seeds for research and take the position that government mandated GMO labeling in the absence of a clear public health reason is unwarranted. But the landscape HAS changed and those kinds of positions usually aren’t being taken outside the context of a general stance towards an issue. There have been changes that have materially affected people’s understanding and changes that have shifted the social psychology of the debate. It’s a much more polarized environment and there have been a number of things that I imagine would have pushed the editorial board of Scientific American into what would seem like a new stance on GMO’s. At the risk of mere projection and wild speculation I’ll give three examples. These are things I believe have shifted the framing of the debate in the social circles of the editors of Scientific American. As the debate has become more polarized a cautious, “responsible” slightly anti-GMO agnosticism has become harder to maintain. The social dynamics of a polarized environment are (tautologically) that people wind up picking sides. Some of that is inevitable in the course of clarifying positions or responding to new data. But a fair amount can result as tribal identification starts to kick in and I don’t discount the social psychology of picking sides based on the positions of those we trust or those whose values we identify with. The EU, for example, has invested more than €300 million in research on the biosafety of GMOs. Its recent report 1 states: “The main conclusion to be drawn from the efforts of more than 130 research projects, covering a period of more than 25 years of research and involving more than 500 independent research groups, is that biotechnology, and in particular GMOs, are not per se more risky than e.g. conventional plant breeding technologies.” The World Health Organization, the American Medical Association, the U.S. National Academy of Sciences, the British Royal Society, and every other respected organization that has examined the evidence has come to the same conclusion: consuming foods containing ingredients derived from GM crops is no riskier than consuming the same foods containing ingredients from crop plants modified by conventional plant improvement techniques. It’s not like science minded people were unaware of all this before the AAAS made this statement, but it’s a clarifying moment. The statements by AAAS and others also underlined that research had continued to come in since the seeds had been made available for independent research and that the new research was consistent with the peer reviewed research which had been conducted prior to the new agreement. In the four years between the two SciAm editorials the report “A Decade of EU Funded GMO Research (2001-2010)” [pdf]had been published, collecting and summarizing a pile of research over a significant time that had been conducted without industry funding. Another significant change had taken place beginning in fall of 2012. Researchers Anastasia Bodnar and Karl Haro von Mogel began cataloging peer reviewed studies relating to GMO safety in their GENetic Engineering Risk Atlas or GENERA. The list of studies included in the database quickly grew from 450 to 600 including well over 100 independently funded studies. It meant that people looking for research done on the safety of GMO’s found themselves facing a formidable collection of peer reviewed studies in a single place. It became difficult to wave away or talk around and the canard that GMO’s hadn’t been thoroughly researched rang pretty in the wake of GENERA’s launch. By September of 2013 it has become nearly impossible for science minded people aware of the issues surrounding GMO’s to be susceptible to the drumbeat of doubt pounded by those who keep saying that GMO’s have not been studied, that the research has all been bought and paid for by the industry, and that a substantial debate exists among scientists about the safety of GMO’s. A major lynch pin of respectable agnosticism that had existed in 2009 had simply vanished by September 2013. What became perhaps the greatest source of polarization about GMO’s also came about during the Prop 37 campaign. In September of 2012 just before the vote on November 6th began the notorious Séralini Affair. French researchers headed by Gilles-Eric Séralini published a study supposedly showing that female rats fed GM corn developed tumors at a higher rate than those fed non-GM corn. (The study also demonstrated a lesser reported health benefit for male rats drinking the herbicide Round Up) The study helpfully included photos of tumor engorged rats (but no photos of control rats) that immediately began appearing on placards, picket signs and pro-37 websites. The study, especially the photos, was an agitprop coup for Prop 37 backers. It also immediately triggered what may, in the end, be a longer lasting and more powerful backlash by science journalists. A backlash that sets the anti-GMO movement back more than the agitprop gains the Séralini study added in moved them towards their goals. Reputable scientists and science journalists were quick to discredit the study and they weren’t pleased. On October 10, 2012 the journal Nature was reporting: “Hyped GM Maize Study Faces Growing Scrutiny“, detailing obvious flaws with the study. A bigger deal, in terms of the cultural dynamics, came when the science writer Carl Zimmer of The New York Times and National Geographic condemned THE WAY the study was released. I don’t like starting the weekend in a state of infuriation, but here we are. On Wednesday, French scientists had a press conference to announce the publication of a study that they claimed showed that genetically modified food causes massive levels of cancer in rats. The paper appeared in a peer-reviewed journal. That being said, outside experts quickly pointed out how flimsy it was, especially in its experimental design and its statistics. Scicurious has a good roundup of the problems at Discover’s The Crux. But those outside experts were slow to comment in part because reporters who got to see the paper in advance of the embargo had to sign a confidentiality agreement to get their hands on it. They weren’t allowed to show it to other experts.
. . . the strategy was clear: prevent science writers from getting informed outside opinions, so that you can bask in the badly-reported media spotlight. Sure, the real story may emerge later, but if you get that first burst of attention, you can lock in people’s first impressions. The documentary about the primate fossil got the audience its producers were hoping for. The French scientists got the attention of the French government, and thus reinforcing opposition to genetically modified foods, although the study itself fails to make that case. Mission accomplished. This is a rancid, corrupt way to report about science. This last phrase became the title of a post at Tracker the blog of the Knight Science Journalism program at MIT. The post details the outrage and alienation that swept through the science journalism community at the shoddy work of the study, the manipulation of the media and the cynical, opportunistic agitprop uses the study was put to in the Prop 37 campaign. The latest audacious example of scientific distortion came last week, in the form of a controversial (but peer reviewed!) study [pdf] that generated worldwide headlines. A French research team purportedly found that GMO corn fed to rats caused them to develop giant tumors and die prematurely. Within 24 hours, the study’s credibility was shredded by scores of scientists. The consensus judgment was swift and damning: The study was riddled with errors—serious, blatantly obvious flaws that should have been caught by peer reviewers. As the parallels between climate science denial and anti-GMO activism began to sink in we witnessed another signal event in January of 2013. The environmentalist and former anti-GMO activist Mark Lynas gave a speech at the Oxford Farming Conference stating it explicitely: His anti-GMO views had been a form of denialism. When challenged on the contradiction between his support and reliance on the consensus on climate change and his opposition to the consensus on GMO’s he was forced to admit that he simply hadn’t grappled with the science or the views and ideas of those he’d opposed. Obviously this contradiction was untenable. What really threw me were some of the comments underneath my final anti-GM Guardian article. In particular one critic said to me: so you’re opposed to GM on the basis that it is marketed by big corporations. Are you also opposed to the wheel because it is marketed by the big auto companies? Except for the apology, none of what Mark Lynas said was news to science journalists. Yet, I have to think that the flashpoint of the convert’s confession, bearing witness to the denialism of the movement he had helped found must have served to sharpen and harden the conception that opposition to GMO’s is a form of denialism and thus something that science journalists must and will reflexively push back at. I doubt that GMO opponents really understand the ground they have lost in the polarization following Prop 37. The success of the March Against Monsanto was surely a success in terms of number of people in the street. The number of people actively opposed to GMO’s and in favor of labeling is certainly up from a year ago. But the number of journalists who understand GMO’s reasonably well and are aware of the scientific consensus is greater as well. While many people get their news from specialized websites and blogs, most people still get there information from professional journalists and I believe the tide has already started to turn in that community. The number of writers turning to people like Pamela Ronald of UC Davis or Kevin Folta of the University of Florida for quotes and background is surely larger. Though I see these changes as good news, I don’t take any particular pleasure in pointing it out. While I believe the polarization of the issue and the resulting affinity bias is part of what brought the editors of Scientific American into taking a fairly explicitly pro-GMO stance in opposing mandatory labeling, the cognitive biases that kick in for all of us in a polarized environment make it harder to think clearly, to weigh inconvenient evidence and to hear our most thoughtful critics. That to me is a loss.